The pilot-to-open double check valve RPDR is inline mounted with two opposing, direct-acting, spring-loaded poppet valves. In the normal position, pressure on the closing element onto the valve seat happens. It is due to the spring and pressure at port C or D, and blocks flow from C to A or from D to B leak free. 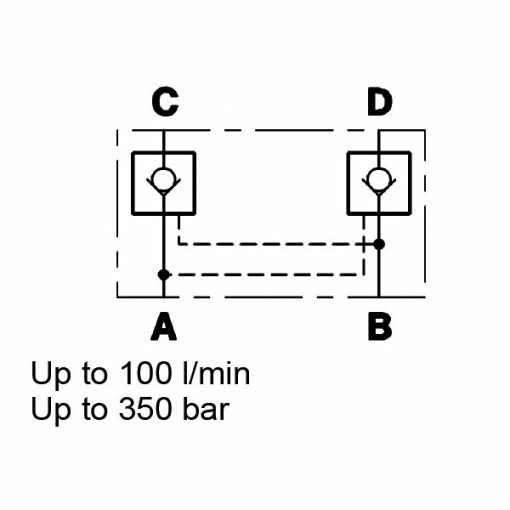 If there is a sufficient introduction of high control pressure at port A or B, the control piston moves. Then, it will lift the closing element off the valve seat. The valve opens and oil flows from D to B or from C to A.